Congratulations to J. R. McConvey, whose story "Home Range" was recently nominated for the annual $10,000 Journey Prize. 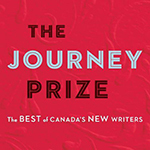 His story will be included in this year's Journey Prize anthology with the other nominees. Originally published in Issue 192, "Home Range" won the annual Jack Hodgins Founders' Award as the best piece of fiction published in the Malahat in 2015 (chosen by judge Marina Endicott). Read an interview with McConvey on his story. Malahat volunteer Jake Byrne recently spoke with Toronto poet Steve McOrmond about his poetry in the Summer issue. The poems form part of a larger manuscript, Reckon, which tallys our contemporary way of living and what we owe. 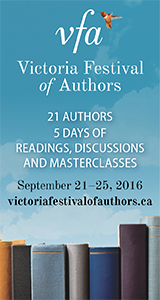 Victoria Festival of Authors comes to town in two weeks with a fantastic lineup of local and national authors. Listen to inspiring readings, check out the diverse voices on discussion panels, or attend workshops to develop your own craft. Some of the many writers include Carmen Aguirre, Brian Brett, Carla Funk, Louise Bernice Halfe, Steven Heighton, Steven Price, Yasuko Thanh, Betsy Warland, and Jan Zwicky. Full details on the VFA site. Additional entries are $15 CAD (from anywhere), no limit! Keep your eyes on the prize! Our annual Open Season Contest is underway. 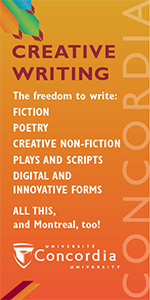 Writers of all levels are invited to enter poetry, fiction, and/or creative nonfiction. There's no theme or specific criteria for this contest, so go wild and send us your best work. Final judges are Sina Queyras (poetry), Jaspreet Singh (fiction), and Molly Peacock (creative nonfiction). Interviews with each contest judge are posted below! Malahat poetry board member David Eso talks with Open Season Award poetry judge Sina Queyras about the rewarding writing life, Montreal's poetry scene, and up-and-comers on the Canadian landscape. DE: What is your impression of the poetry scene in Montreal? What kinds of venues are generating the most excitement? Do you find many opportunities for multi-lingual poetry events in your city? 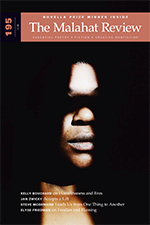 How would you characterize the relationship between practitioners of spoken word, lyric, narrative, and experimental writing? SQ: My students are doing kickass work and Montreal is a foodie performance lifestyle paradise. What kind of work? Starting journals, curating pop up events, performances, creating, being part of things. Readings are really well attended. The scene is sprawling out, literally into the parks and fields and alleys. Montreal may be the last affordable cosmopolitan location in North America and people are still able to have really engaged lifestyles. Read the rest of Sina's interview on the Malahat website. Malahat fiction board member Liam Workman talks with Open Season Award fiction judge Jaspreet Singh about the longevity of the short story, Roberto Bolano's fiction, and due diligence when submitting to contests. LW: Every year someone new is proclaiming the short story dead, or the novel dead, or the play dead. But people are still entering contests every day, and more and more online journals seem to be sprouting up. What are your thoughts? Are things really as dire as some people say? Or are the old forms actually dead? JS: In the times of Elena Ferrante it is really hard to declare the novel dead. Third rate homicide detectives, or writers who have lost steam, or critics desirous of quick attention often come up with such preposterous ideas. But really this is not a bad thing. Even Einstein's theory of relativity gets challenged every now and then! Crucial new experiments and tests only end up increasing our 'faith' in the theory. Each time someone pronounces the demise of the novel or the short story, we the readers discover that these forms are more alive than ever. Read the rest of Jaspreet's interview on the Malahat website. Malahat creative nonfiction board member Maleea Acker talks with Open Season Award creative nonfiction judge Molly Peacock about the Canadian creative nonfiction scene, an author's shift in writing circuits, and female voices in the literary world. MA: What are you looking for in creative nonfiction contest submissions for the Malahat’s Open Season Awards? What makes your heart leap and your mind light up? MP: A fresh, authentic voice with some vulnerability and candor. A voice that doesn’t pretend it knows everything. A thought process both substantial and surprising. Subjects? Anything from the quietly personal to the devastatingly political. And always, arresting vocabulary. Read the rest of Molly's interview on the Malahat website. Malahat poetry board member Samantha Ainsworth talks with Far Horizons Poetry Contest winner Yusuf Saadi about his poem, "The Place Where Words Go to Die." Saadi's poem was chosen from over 500 entries by contest judge Steven Heighton. SA: Your winning poem sizzles like a battery on the tongue. When did you first recognize or learn of language's ability to spark the senses? YS: I can't remember a specific moment where I had an epiphany that language can "spark" the senses, but I think all of us have an intuitive sense that language is synesthetic; everyone who reads literature experiences at some point that spine-quiver when a line, word, or passage resonates with you. Words aren't only signification in an intellectual sense; not only does the word's "idea" overlap with our senses, but we know that a word has a material form, a body, that we can connect with our own bodies. Read the rest of Yusuf's interview on the Malahat website.